Ron Horner says first impressions were so good he wanted to buy one. The extendable dipper has a 3m-plus digging depth and a 4m reach. JCB’s 1CXT is a small tracked backhoe loader that combines all the attributes of a mini excavator and a skid steer. And Ron Horner thinks it’s brilliant. When I was a young and aspiring operator, I could not wait to get my bum in the seat of any machine at any time to take up the challenge of a new piece of equipment to test my skills. As I gained experienced and had proven expertise on particular equipment, I tended to avoid some items of gear such as the old International Hough 100 loaders, Wabco scrapers, and some open-cab and cable blade dozers … too bloody rough and/or dusty. I preferred the comfort of a good old excavator any day. A severe workplace accident some years ago means that the older I get, the more I avoid anything that will knock my aging and aching body about. Top on the list are skid steer and compact track loaders. So imagine how I felt when I answered the phone one day and the editor asked the question I most dread: "Ronnie … do you think you could have a look at a skid steer for us, please?" Bugger! What Dave was talking about was the JCB 1CXT, a compact backhoe loader with tracks, which the UK company refers to as "the world’s first skid steer backhoe". 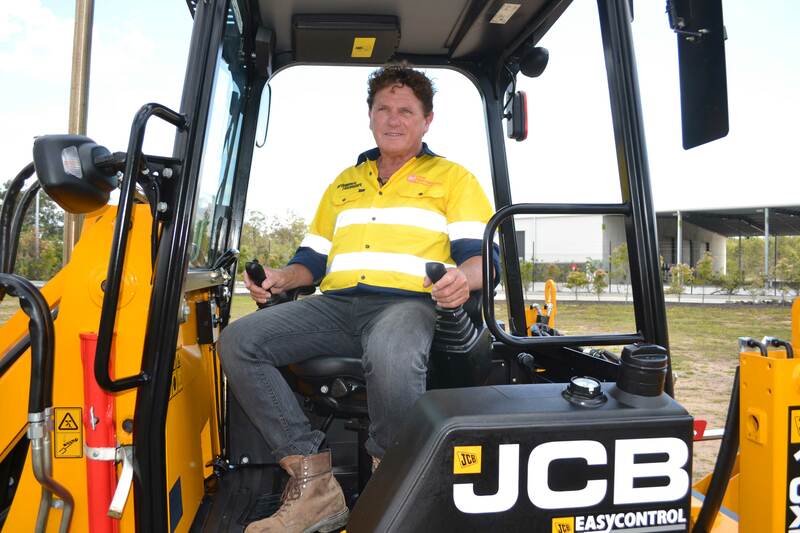 Construction Equipment Australia has the distributorship for JCB in Queensland, and the Brisbane yard is a mere 100km away from my property, so I was intrigued enough to head down there and check out the dreaded skid steer loader. 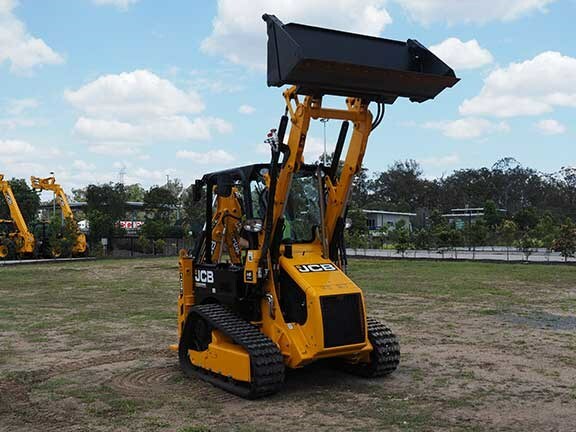 Sitting on the demonstration pad in the Brisbane yard was (and it pains me to say it) a neat-looking tracked backhoe loader with a four-in-one front bucket and a backhoe attached to the rear end. First impressions count a lot and, to say the least, this machine looked the goods to me. If I was ever in the market for something based on looks alone, I’d have snapped it up right there and then. Access into this little fella is excellent – the open cab with side entrance is a perfect fit for fat blokes. The side access takes away a lot of the awkward issues one finds in gaining access via the front, as in more conventional skid steers and also gives better vision and minimises any safety problems such as possible slippages and falls between the bucket and loader arms. The seat is very comfortable and the cab is not confined in any way. 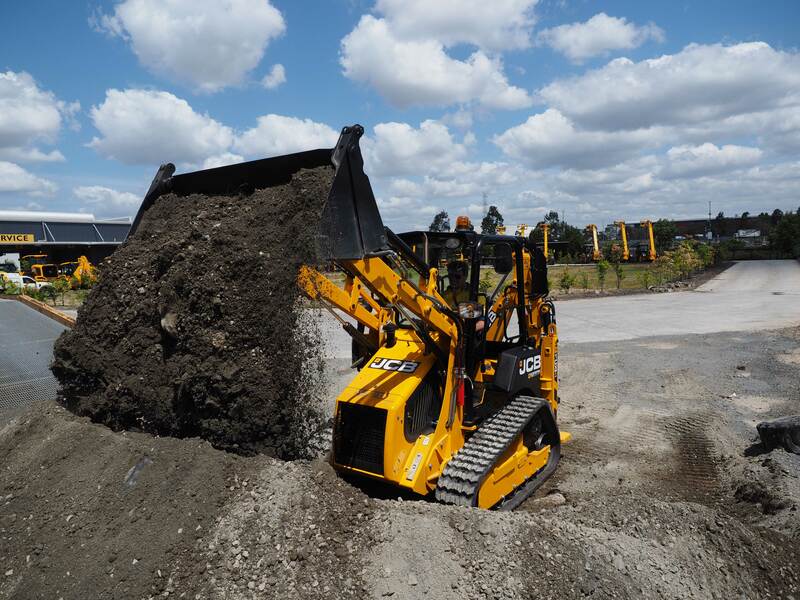 Vision is excellent and one can see the benefits of JCB’s innovation in providing a loader on a skid steer base with excavator performance in a single package. Operators can rest easy with the controls of this little beauty. The twin joysticks to the left and right of the operator’s console are brilliant. The left joystick controls the travel motion by a simple ‘point and drive’ — forward/reverse/left/right. It’s so darn easy as there are no foot controls! The right-side controls are straight from the loader range with up/down/load and dump, and are oh so smooth. 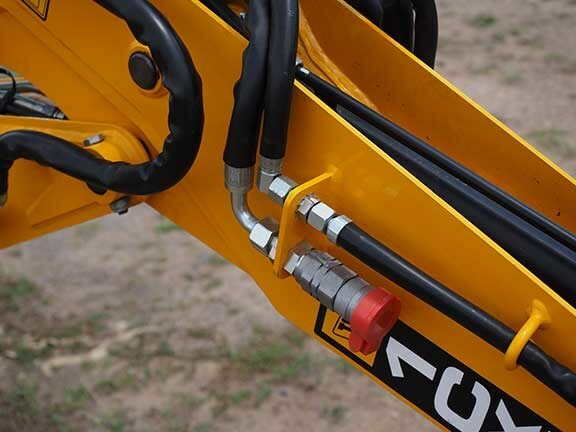 Innovation in the backhoe area has not been left out on the design of the 1CXT either, with the option of backhoe (SAE) or excavator (ISO) controls linked to the same control levers as the front-end bucket. A quick lever pull and the seat swings to rear control with ease (it can even be operated at 45 degrees as well). By switching to backhoe mode and your choice of operating controls, the operator is left with no excuse but to perform. The dashboard is littered with buttons and switches to the right of the operator (in forward motion). They’re tucked away from vision – you have to look sideways and down to check them out – but simple and clearly defined is the go here. Already my dislike of skid steers was slowly but definitely diminishing, and I hadn’t even got it out of idle or ‘upped’ the stabilisers. 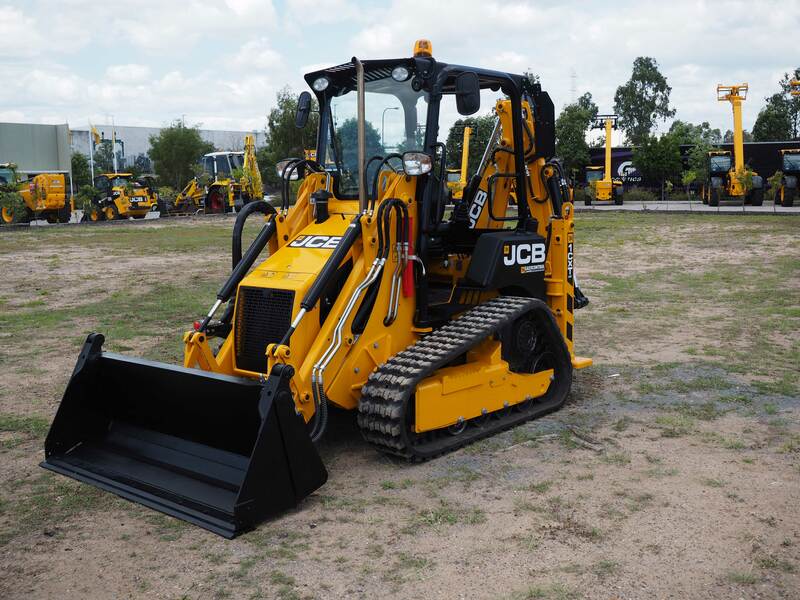 The JCB 1CXT is designed with a one-piece bonnet and removable side panels. Once removed, access to the powerful 50hp Perkins naturally aspirated diesel engine is possible from ground level. It pushes out 36.3kW with 140Nm of torque. 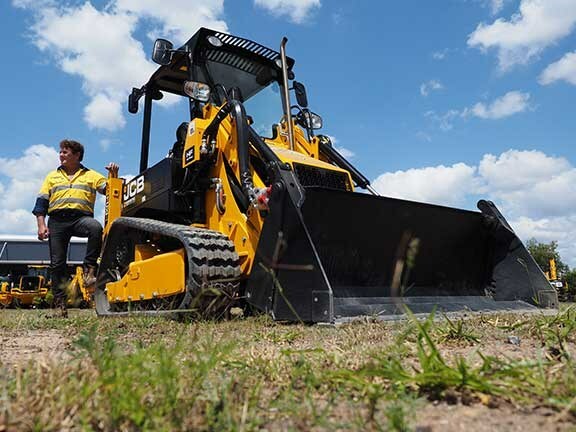 Combined with the rubber track configuration, this gets heaps of power to the ground and makes this machine a little powerhouse that punches far above its weight. All the filters and oil checks can be carried out from one side, with radiator check easily reached across the top of the engine if one is too lazy to make the 2m walk. Nice and compact design with good weight distribution from the engine placement gives this machine excellent balance when operating with a loaded bucket. The rubber track configuration not only delivers more power to the ground, it also minimises damage to the surface areas, has developed exceptional climbing ability, can push in wet conditions, and has fantastic stability in those softer conditions. A simple flick of the travel lever and the tracks got the 1CXT turning in its own radius on the good surface that we were operating on. It is claimed that it can work on a 31 per cent gradient, but I believe it can do better than that because it is so well balanced. It is also claimed that the bucket capacity has increased by a whopping 14 per cent. Although we did not have any hydraulic attachments fitted to this unit, the JCB high-flow hydraulic circuit delivers 100 litres per minute and can run all of your high-flow attachments. The backhoe is the winner for me. Optioning the ISO controls made me feel very comfortable and in my element. A flick of the button on the control lever and we had the extendable dipper running at full length, giving us more than three metres of digging depth and almost four metres of ground reach. This equates to minimal tractor movements when in dig mode on a trenching project. The hydraulic slide is very strong and designed to handle a hydraulic attachment such as a hammer or compactor plate without the operator losing too much sleep over damaging it. 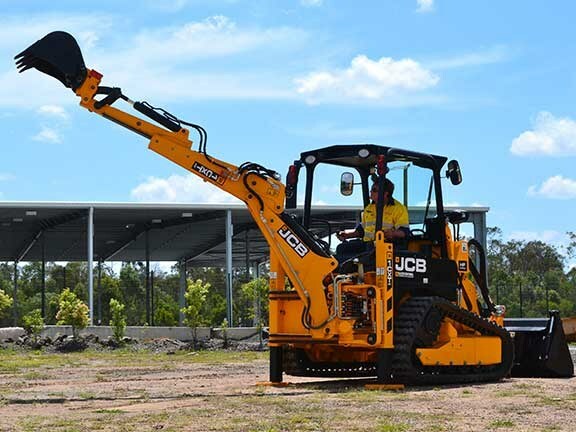 This backhoe attachment is equivalent to that of a 2.5-tonne excavator, so you get plenty for your money with this mighty workhorse. The operation of it was very smooth and, in the ISO mode, one would not blink an eye thinking you were on anything but a small open-cab excavator (a fully enclosed cab is available). The fully integrated hydraulic side shift is a breeze to operate and saves time – and wear and tear – over the old ‘push/shove’ method. It can work close to walls and embankments, and is perfect for street works with its rubber tracks and the rubber pads on the support legs. 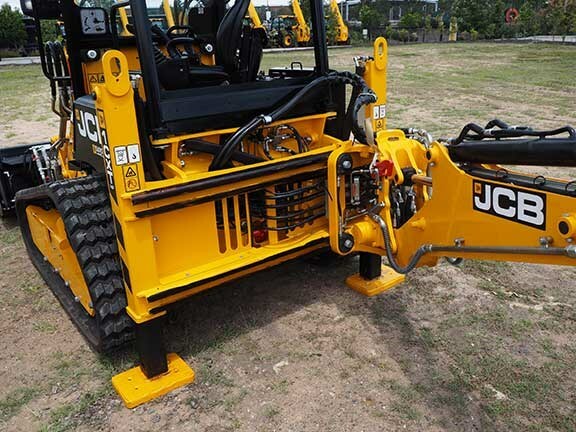 The machine is fitted with JCB’s manual quick hitch, auxiliary hydraulic lines, and brake pressure valves. When I received Dave’s phone call to come and have a look at the JCB 1CXT, due to my aforementioned dislike for operating skid steers, I wasn’t that worried that we could not run this machine in a full-on working environment. However, after being exposed to the machine for the day, and only running it at the JCB Brisbane yard, I must say I came away very disappointed. Don’t get me wrong, I was not disappointed in the machine! It’s just that I was so impressed that I wished we had more time and a working area to push it to its limits. The JCB 1CXT backhoe loader is so specced-up and impressive that it has done something I never thought would happen to me … my fears and dislike of skid steers has reduced dramatically. If I were 30 years younger and in the market for a backhoe loader, I would have ordered this one on the day of the review. This is not only based on the loader’s several innovations, but also on simple things such as the foot throttle for the loader, the multi-directional single joystick for travel, the interchangeable controls from SAE to ISO controls when digging from the same operator’s seat, and the ease of accessing the cab from the side entrance. We’re planning on doing a full-on demonstration on our own turf, but you know what? I seriously doubt the outcome and my opinion will be any different!